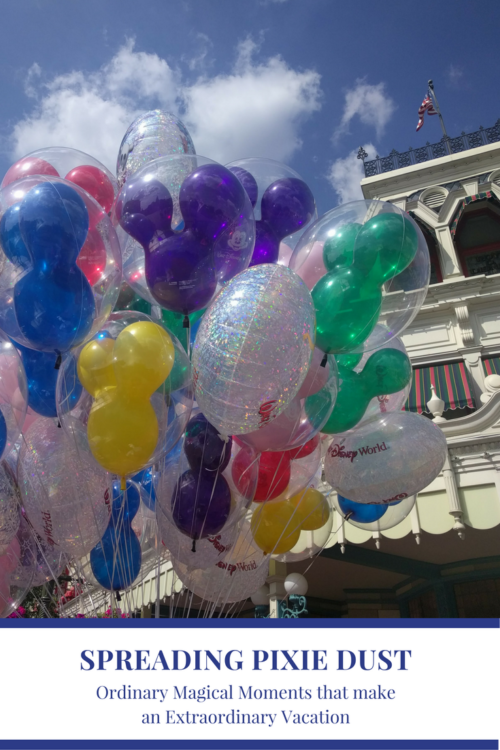 What makes a vacation to Walt Disney World so special? It’s the unexpected Disney magical moments that create a memory you share over and over. And at Disney, cast members go out of their way to make magical moments happen. Not sure what constitutes a Disney magical moment? Read on. We promise it will make you smile. We knew we were late. Night had set over the Magic Kingdom and crowds were settled in shoulder to shoulder for the fireworks. We’d spent a little more time in Adventureland than we probably should have and knew it would be tough finding a place to watch the pyrotechnic show. We weren’t upset. A little tired maybe, but otherwise happy. It had been a good day. So we followed him right in front of the castle, to an empty area behind a gate. Crowds of people were squished together all around, but beyond the iron fence, this little piece of real estate was empty, like a secret garden in a crowded city. A family of six on a VIP tour joined us later, but even with then, we still had plenty of room to sit down, spread out and totally enjoy the fireworks in our own private viewing area. There was a family close by with older teens. They were about the same age as my two high school boys who couldn’t make it to Disney for this trip. We approached them. “We have three fast passes for Space Mountain. Know anyone that might want to go with us?” The dad didn’t skip a beat – “These are your people!” and gave the three teens a little push toward us. So we rode Space Mountain with these folks. They were from Canada. It was spring break and they didn’t want to just sit on a beach. The boy in the group had never been to Disney before. This was his first time on Space Mountain. We clued them in to the camera location at the beginning of the ride. After laughing at the photos, we pulled out another fast pass from Ethan. “Want to go again?” This time, they knew where the camera was and got an awesome photo. “You have to get that one,” we stated, and they did, a memento of their Disney magical moment. It felt good to make someone’s day, to be a part of the story they would go back home and tell friends. We ended up with two additional super fast passes that we didn’t use. Upon our return home, I posted on a message on Facebook that I’d share them with anyone going to the Magic Kingdom soon, on the condition that they pass on a kindness while they were there. Kevin Weeden answered the post. In the end, he didn’t need them either and passed them on to a lady in line who had not reserved her own fast passes for the day. My son and I counted up. Ethan kindness touched 15 people that we know about. If Ethan only knew how many people he made happy. 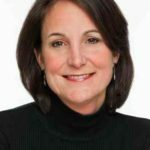 Our experience got me thinking. 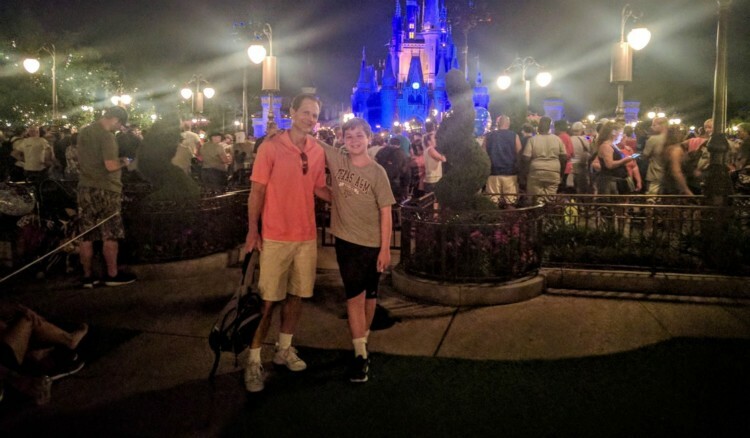 Did other people experience Disney magical moments too? 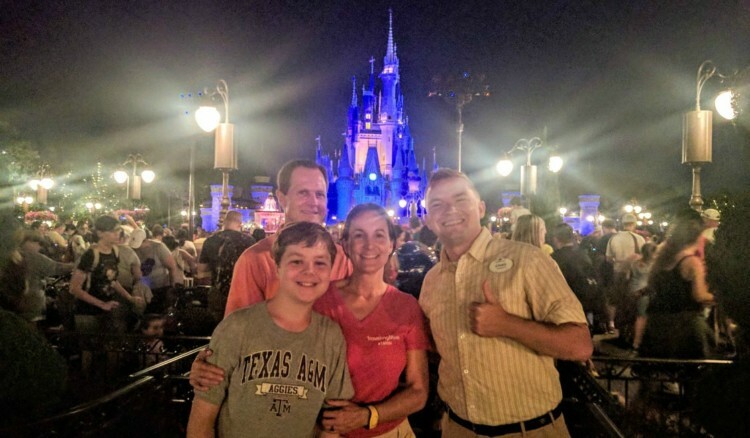 Our visit to Disney World was part of the annual Traveling Mom Conference, so I asked my fellow TMOMs if they had experienced magical moments too. All of these Disney magical moments happened within the four days of our conference. Disney Magical Moments aren’t just for guests. They happen to cast members too. Right after college, I worked in guest relations at Walt Disney World’s Hollywood Studios (back then it was the Disney MGM Studios). That was more than 25 years ago (yes, I’m old). Recently, I was tagged in a post on Facebook. 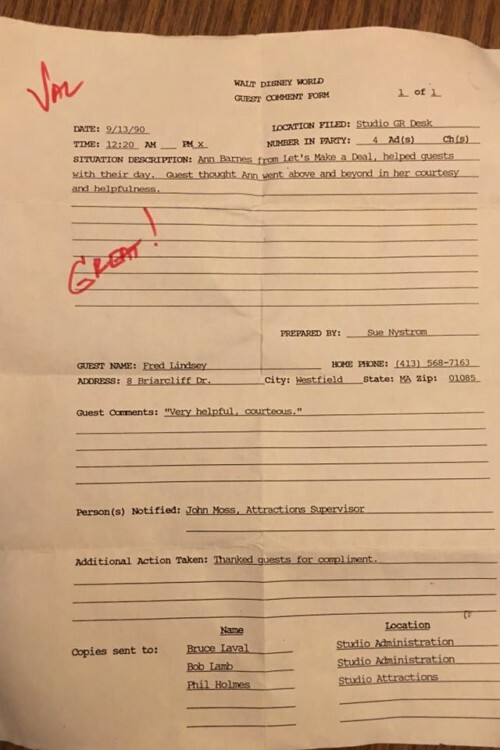 It was a Walt Disney World guest comment form from 1990. Fred Lindsey came into guest relations on September 13 and I had talked to him. He wanted to let me know that Ann Barnes had gone above and beyond to make their day a good one. Ann had been ‘very helpful, courteous.’ Three words. That was it. Ann has kept this sheet of paper for more than 25 years. She proudly posted it and tagged me. I don’t even remember Fred Lindsey, or our exchange, but it makes me smile to see it all these years later. Ann’s comment form reminds me of my time as a cast member. My first job was as a tour guide at the Backstage Studio Tour. At that time, we would choose three children to be a part of the show. They were able to ride a bee in front of a green screen just like in the movie Honey, I Shrunk the Kids. Sometimes you’d get a kid that was really bummed that he/she didn’t get picked. If possible, we’d take them aside after the tour. “Come with me,” we’d say and take them backstage to the soundstage with the bee scene. We’d alert the next tour guide not to worry about picking kids, we already had them waiting. As cast members, we loved being a part of the magic, and maybe helping to create a little of our own too. That was, and apparently still is a cast member’s super power – they have the freedom to go the extra mile, to make a fun experience extraordinary – to create magical moments. And that is what really sets Walt Disney World apart from other vacation destinations. So tell us, what is your Disney Magical Moment? Headed to the Happiest Place on Earth? TravelingMom recommends Undercover Tourist for discounted tickets including $7 off Mickey’s Christmas party tickets and $8 off Mickey’s Not So Scary Halloween tickets.